Children are sure to smile as Suzy sets off to the woods in search of peace and quiet — cluelessly evading a trail of hungry critters in her wake. 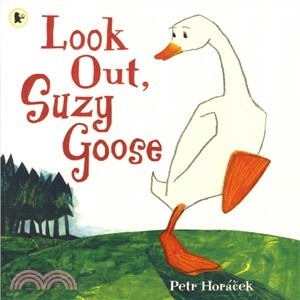 One afternoon all the geese are honking — except Suzy Goose, who is heading off to escape the noise. Suzy loves being alone in the woods, but the fox (TIPTOE), the wolf (CREEP, CREEP), and the bear (PAD, PAD) on her trail have other things in mind! Bold, energetic illustrations follow Suzy on a suspenseful adventure, saved by a funny near-miss that sends her back to her flock.